We would love to have you! 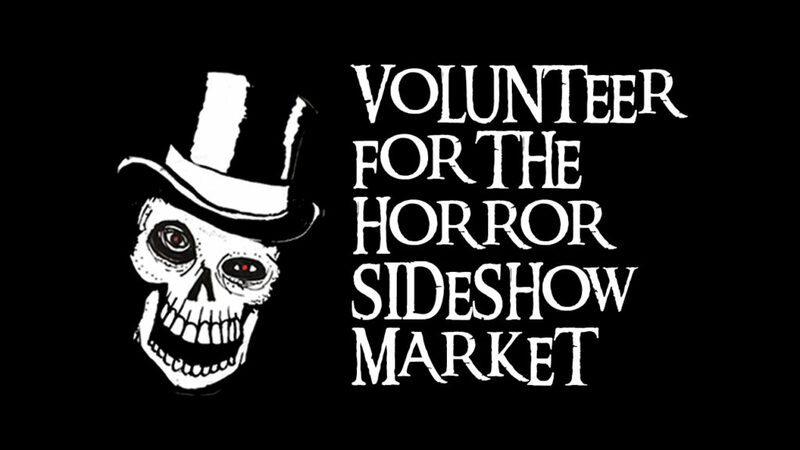 We want fun, hard-working, and passionate volunteers who want to help us in making HORROR SIDESHOW MARKET JUNE 2019 experience the best event we can be. HORROR SIDESHOW MARKET JUNE 2019 relies on the help of over 15 volunteers working in all aspects of the MARKET. Volunteers are needed for the 2-day event. You must learn all show details and meet other volunteers before the show. All volunteers need to submit a completed Volunteer Application to be eligible to volunteer for HORROR SIDESHOW MARKET JUNE 2019. All applicants must be 18 years old or older with a valid ID to apply. You are expected to arrive for your shifts 15 minutes early, dressed appropriately ready to work, and with a good attitude courteous attitude at all times. Volunteers should plan on working hard, and enjoying what the show has to offer. As a volunteer you can expect to be a huge part of HORROR SIDESHOW MARKET JUNE 2019 team.You can expect to be treated with courtesy and respect. We want this to be a positive experience for everyone involved; you should expect to work hard and have fun. While there is a great deal of work for us to do, there is also time to make new friends and enjoy the show. Volunteer shifts run about 6 to 8 hours. A minimum of 2 shifts are required for all volunteers. If you are interested in becoming a volunteer, please fill out the application form and will get back to you.